This is merely an extract from a much longer piece, which I have cut out purely for selfish promotional reasons; and I urge you to listen to the full eight minutes, which can be found here. I designed the cover using photographs by Lisa Hack and Hannah Brown. I am very lucky to know so many talented people! Entirely produced on site at Bush House, using field recordings made within the hallowed hallways, two elderly reel-to-reel machines and not that much else, I’m happy to say that it’s now ready for your perusal, and is also the second official release on my newly-launched micro-record label ‘The Fog Signals’. Some might call it a vanity label, but I’ve long-since stopped inviting those people round my house. Ghosts Of Bush’ was created entirely using the natural acoustic sounds of Bush House, the iconic home for the past seven decades of the BBC World Service which will shortly be closing its doors for the last time. All of the sounds were captured in the small hours of the morning in empty offices, corridors, stairwells and other hidden corners by a Studio Manager working overnight. These recordings were then dubbed onto quarter-inch tape in the basement studio deep in the bowels of the South-East wing using two of the surviving reel-to-reel machines. 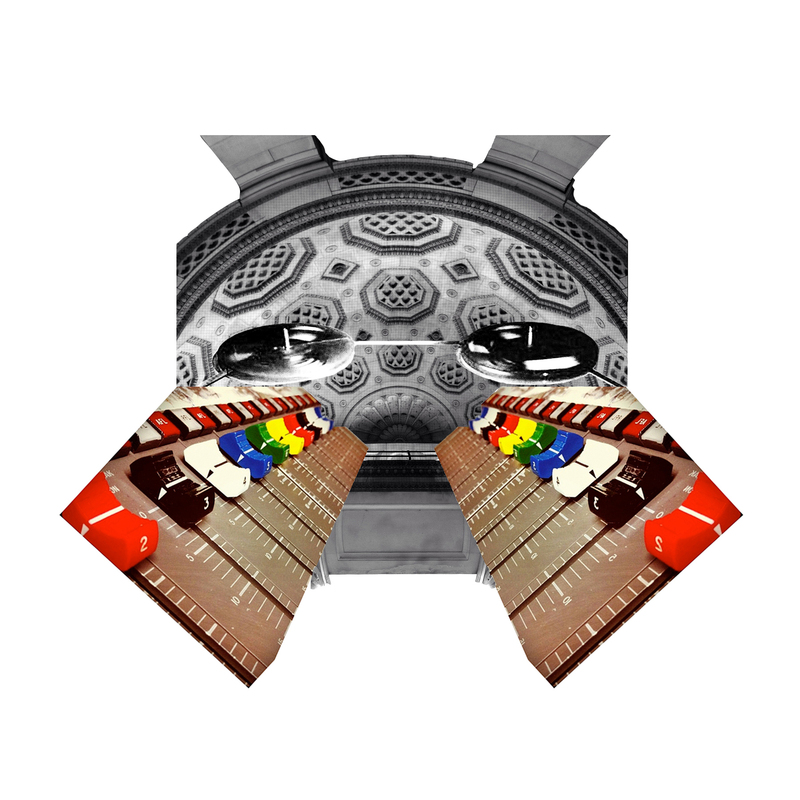 Adjusting the playback speed of the spools and ‘bouncing’ the recordings between the two tape machines lead to the discovery of a number of interesting phrases and sound textures which were then looped, layered and fashioned into rough compositions. Over time the tape would start to degrade and alter the nature of the sounds, while occasional echo was created by recording and playing various loops simultaneously, feeding the sound back into itself. The entire album was produced using these simple methods, and no other effects or studio trickery have been used. Thanks to the sonorous quality of Bush House’s Portland stone walls and high ceilings, the natural resonance of the space was all that was needed. When talking of historic buildings it’s become something of a cliché to say ‘If these walls could speak…’ I like to think that on ‘Ghosts Of Bush’ we come close to hearing them sing! I hope that this album not only captures the size and the grandeur of this now largely empty building, but also a sense of its history too. As well as being produced in a rapidly disintegrating studio using equipment that was decommissioned years ago, buried deep within the mix are call-signs or ‘idents’ from a number of the BBC’s Language services, many of which have also closed down in recent years. 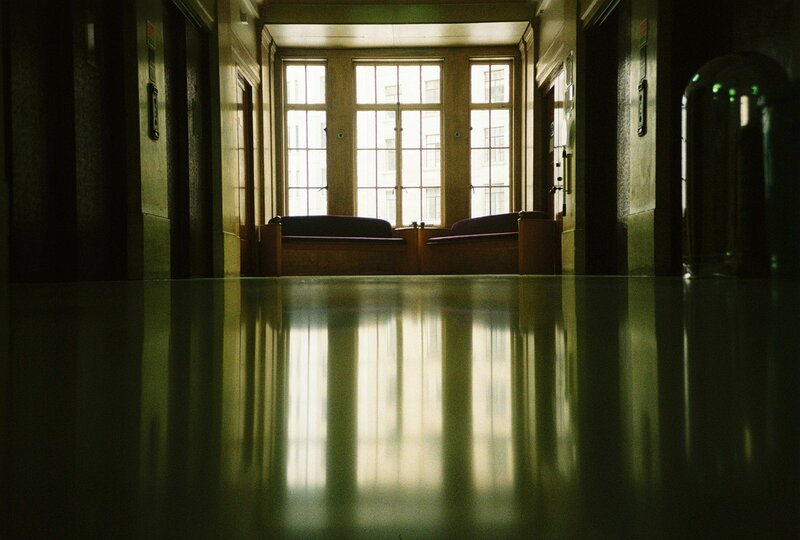 By working in this way I wanted to create a sense of poignancy in the gradual winding-down of Bush House’s facilities, the emptying of its spaces and the departure of its people, as well as commenting on the passing of time and the impermanence of all things. This very personal project was created partly to mark the dying days of a bygone era, as a last hurrah for obsolete equipment and a studio that will soon fall silent forever. It’s the sound of many sleepless nights spent isolated in a labyrinthine basement surrounding by a crepuscular soundtrack of creaks and crackles. It’s an attempted homage to the work of the BBC Radiophonic Workshop who crafted the most incredible of sound-worlds from the most basic of sources. But mostly it’s my way of saying goodbye to a building that I and so many people have loved. A former hive of industry that now stands almost deserted. I really hope that on this album the listener gets a sense of all these things. The best feedback so far? A comment from one listener that I had earned my ‘Radiophonic Workshop Badge’! High praise indeed! So, there we have it. Six months work and finally it’s out there. Perhaps now I can at last get round to tidying my room? Geeky post-script: As you can see, I’ve broken the album down into six tracks to make it more palatable, although really it’s supposed to be consumed as two separate sides of continuous music. For that very reason there will be a limited cassette run in that not-too-distant future, so keep your ears peeled if, like me, you hate the slight jump that occurs when skipping between tracks that are supposed to flow into each other. Indeed, if you have already downloaded a copy of the album yourself and are finding that very thing irksome, then get in touch and I’ll send you an additional copy of the album as two separate files. Or a cassette. Whichever you prefer. I know, I know. It’s only 35 seconds. But seriously, have you ever tried sitting still for that long? Plus my camera has a tendency to get upset if I make it do anything for longer than that. 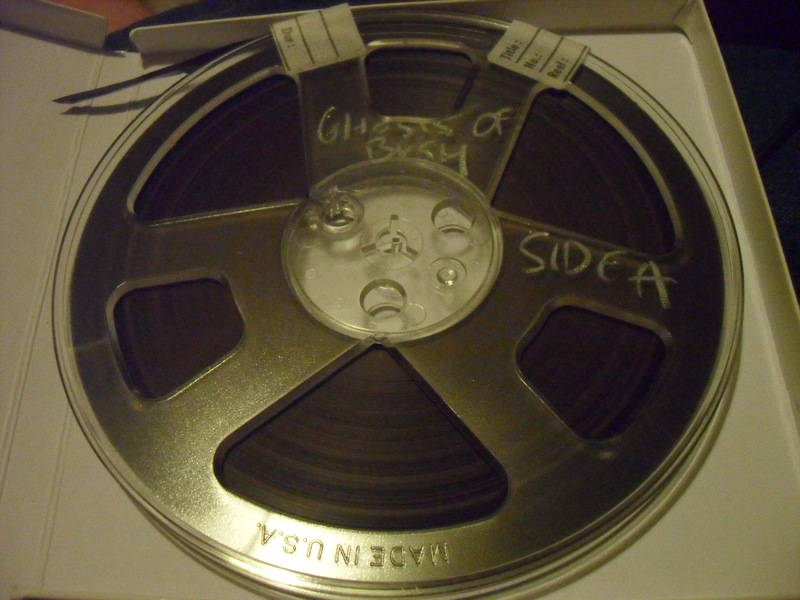 Anyway, here it is, the master tape! I think we could well be finished! I know that a week or so ago I perhaps stretched the boundaries of plausibility and even the patience of my legions of admirers by suggesting that I might have been on the front page of The Wire, when in fact it was somewhat further inside the issue; but I maintain that this was hardly bending the truth, merely flicking it back a few pages, and that there really was no call for certain individuals to start throwing the F-WORD* about so liberally. Anyway, now the smoke has had several days to clear, I’m hoping it won’t affect the public reception of my latest absolute non-whopper. Last month I not only did (really, genuinely) appear in The Wire, I also briefly and even more genuinely appeared on the Norwegian equivalent of Radio 4! You could NOT make that up! This is the sound of another BBC employee saying goodbye to Bush House […] Studio Manager RW has recorded the natural sounds in the old building. A creaking door handle on 5th floor and the peculiar resonance in the marmot stone at 4am when the building is quiet. […] The recordings are then played back on old tape machines and repeated in various speeds. This is how a “sound man” [meaning sound engineer] says goodbye to Bush House. Trygve tells me that this piece was commissioned by NRK (The Norwegian Broadcasting Cooperation) and that this edition of ‘Ekko’ was broadcast on their channel ‘P2‘ (roughly the equivalent of our own dear Radio 4 – perhaps we could even call it Radio Fjord – actually, no that’s rubbish) on 25th May 2012. If you’d like to hear the whole thing it was made available on iTunes as a free podcast, which should hopefully still be available by clicking here. But for now my huge thanks go out to Trygve for including me in his programme and I urge you to go and visit his website. Partly because the man has a list of credentials as long as your arm with over fifteen years working as a journalist, broadcaster and photographer for Norwegian Radio, Sky News TV and more; and partly because he’s looking for someone to help him re-design it! I’m hoping to spend this week putting the finishing touches to the album, which is shaping up to be a limited edition gold(!) cassette plus the usual downloads. I’m also working with photographer and Lomography ace Hannah Brown who has taken some amazing photos for the project, including this one below which might well end up being the cover. We’re getting awfully close now. Let’s hope I can finish before the lights go out and won’t be forced to do any more creative subversion of the facts in order to do so.